The iconic Hong Kong docks is one of the busiest seaports in the world. Offering 9 terminals, the average turnaround time from unloading cargo from shipping vessels is 10 hours. The port spans from the Kowloon side of Hong Kong across the harbor to the adjacent island of Tsing Yi. The surrounding metropolitan sprawl is a clear reminder that Hong Kong is the quintessential definition of a concrete jungle. 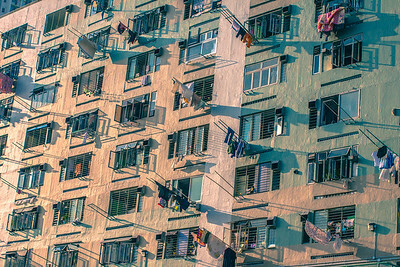 Tong Laus are older tenement buildings that stylize the denser areas of Hong Kong. They are often heavily subdivided with many, many more rooms existing than when first built, offering much cheaper rent in one of the most expensive places to live. Hong Kong and Kowloon separated by a slice of water, called Victoria Harbor. All night this city shines. In the left, you can see the ICC, one of the tallest buildings in the world. Center is the IFC 2 tower, and of course anyone who has played Sim city will recognize the Bank of China tower on the right. A lost perspective. Nature above it all in a concrete jungle. This is the Shing Mun river. It flows through many towns as it makes its way to the China sea. Throughout the day, it is filled on both sides with pedestrians looking for a beautiful escape from the monotony of living in a concrete jungle. Slumber at night, where the boats sit tight. In this section of Hong Kong used to stand a grand treat, a city walled off from all legitimate authority, and was run by the Hong Kong triads. Unregulated, the residents there would do cheap services and sell these to outside venues. The area was called the Kowloon Walled City, and existed only 20 years ago. Now it's just a park, with the occasional pillar or wall to remind us what it was once. 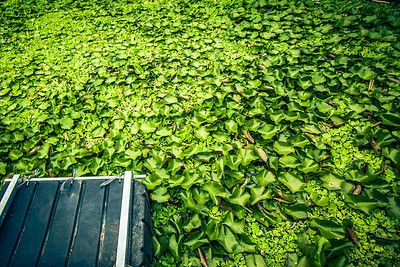 On a walk on the outskirts of Yuen Long in Hong Kong, you can find this friendly pit stop, run by an elderly woman with a beautiful garden, large koi, and this floating walkway through millions of water hyacinths . Watch your step. 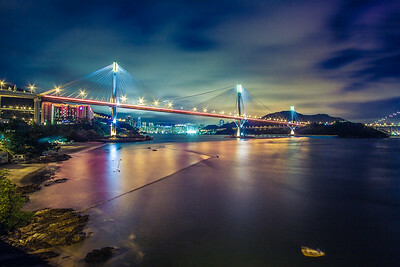 This enormous bridge links Tuen Mun and the small, yet incredibly busy, island of Tsing Yi. I especially love the coasts of these two areas, with promenades stretching the length of the area. Isn't it strange that you can feel so much from such a simple image? You don't even need context as to what is happening here, and your head fills with different ideas, perhaps nothing to do with the actual situation. 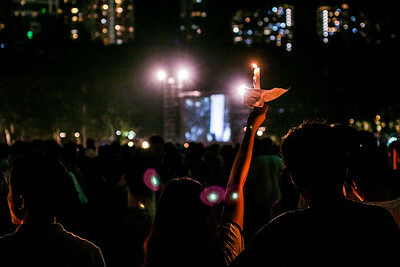 This image was taken during the Tienanment square candlelight vigil that is held in Hong Kong every year to remember those who were there in Beijing, 40 years ago. Mong Kok is full of a thick contrast when it comes to culture and buildings. The area is heavy with old and new buildings that interweave. 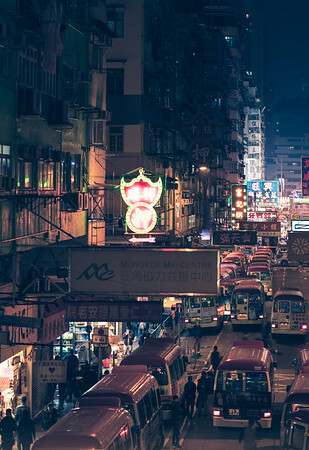 If you've ever watched Ghost in the Shell, they drew the entirety of that area (which is presumed to be Hong Kong anyway) just like Mong Kok. Over the northern border of Hong Kong lives a beast made of silicon, Shenzhen, China. 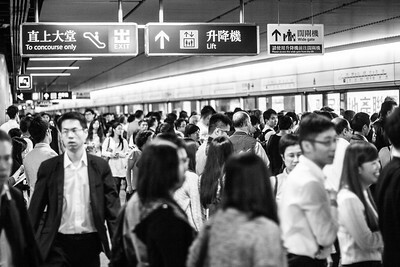 This city, an infant in the world, has flared up after becoming the tech city of China. Many computer and cellphone parts are manufactured here, so overwhelmingly, that they say you can send out a hardware prototype request in the morning and have it arrive before the end of the day. It's a juggernaut of a city that only continues to grow and attract giant companies to it's fertile grounds. 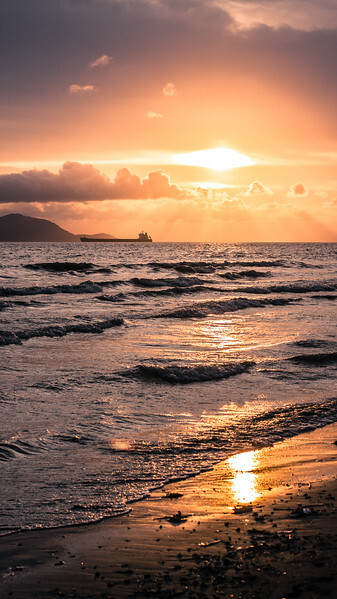 The sunset before Super Typhoon Mangkhut hit Hong Kong. A day before, it barreled through northern Philippines at nearly 300 km/h and killing almost 100 people from landslides. 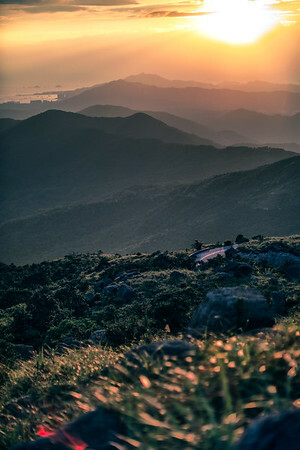 Taken on Tai Mo Shan, Hong Kong. 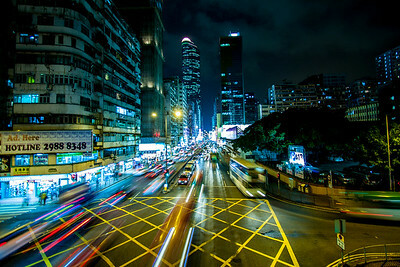 This is a revisit of another shot that I took awhile ago of Mong Kok. 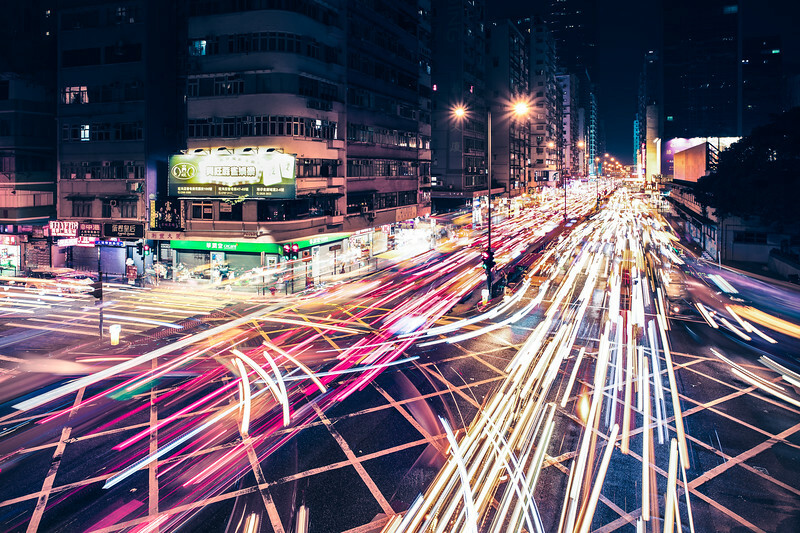 The city is the most densely populated place in the world, and the traffic that moves through it, even here at around 10PM, reflects it. Tokyo is not the only place with eerie, red sunsets. Hong Kong's rolling mountains occasionally steal the show, when it's not being completely overrun by haze. 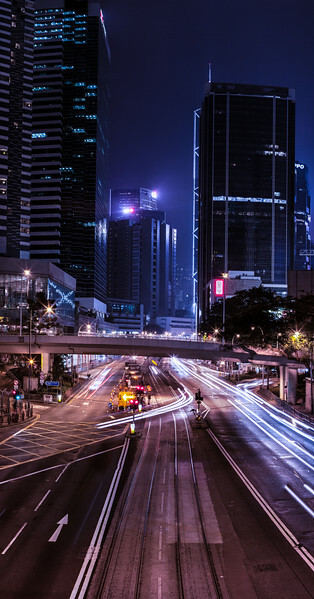 The colors of lights from the many, many buildings in Hong Kong's Central, Admiralty, Sheung Wan, and Wan Chai districts dizzily swirl together on a dark palette. 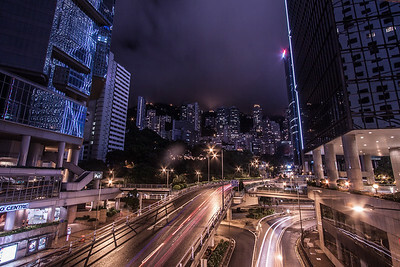 Admiralty is an area in Hong Kong that, for the most part, contains the financial superpowers of Hong Kong. 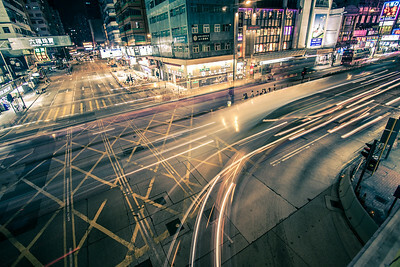 At night, taxis, cars, trucks, buses, and trollies zoom through the area like manmade fireflies. The train system in Hong Kong is quite good. 3 minutes between each train, yet some days it seems like too long. The many stairs of buildings up to Victoria Peak, Hong Kong. A little adventure. 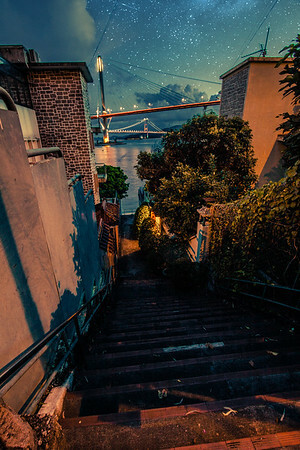 When trying to find a certain spot on Google Earth to photograph the sunset between the Ting Kau and Tsing Ma bridges in Hong Kong, we missed the sunset and as we walked back, spotted this phenomenal composition. Hong Kong is a fierce child. It tasted a democratic existence while under British rule, and is going through a transition as China swallows it back up. The youth fight this change, and it's a sight to see. 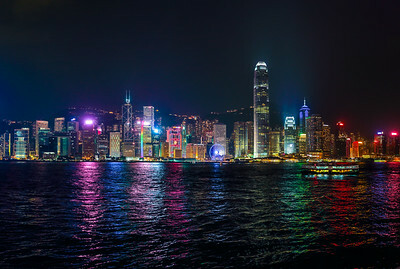 The skyline of Hong Kong is something that surpasses any description given to it. The blue algae blooms in Hong Kong are incredibly beautiful, however in many cases it’s caused by agricultural runoff. These chemicals seep into the bays where villages depend on fishing. 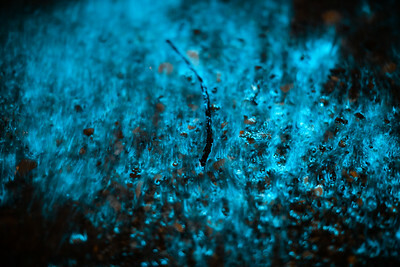 Without sufficient water circulation, it builds up and creates the perfect habitat for Noctiluca Scintillans, an algae, that when disturbed, gives off a fluorescent blue glow. While itself not toxic to wildlife or humans, it's just another symptom to a bigger problem. Their pads breach the oily liquid, but are content. 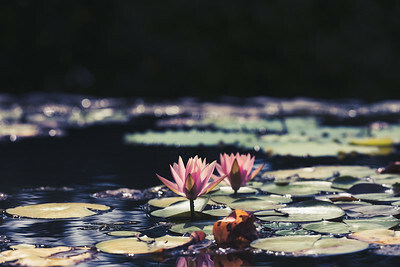 It's only the budding flower, which is delicate and vulnerable, that reaches for the sky and transforms. A scene from Kadoorie Farm in Hong Kong, a magical place to visit. 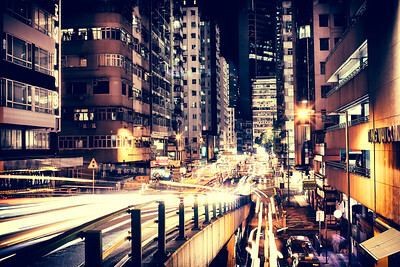 In Hong Kong, minibuses are driven incredibly fast through the bustling cities full of people, usually without incident. They are a transportation that demands you know Cantonese, and very intimidating for the gweilo. They get you to your destination god-speed fast. A street that I pass so frequently at night, and I always admire. The lights shine all night, enticing passerby's. Hong Kong's waterways are often populated to the brim with residential skyscrapers growing like trees out of the canal's soot. Ma On Shan is not an area I'm particularly familiar with, but the colorful buildings have always caught my eye, since you fly by them if you take the train anywhere near the area. Hong Kong has long clashed with China, this is no secret. 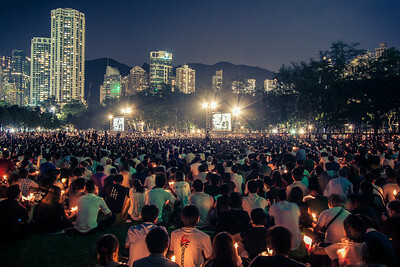 One of the largest disputes has been the Pro-Democracy movement, which many people on both sides have a lot to say about it. 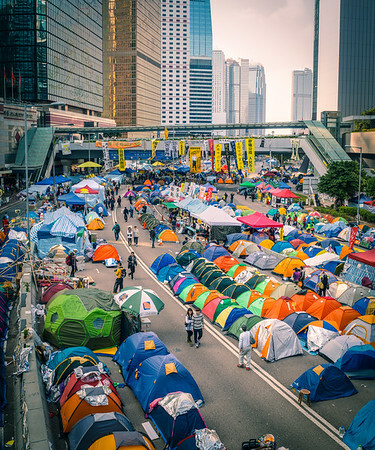 This is Admiralty, Hong Kong's financial center, during a huge protest where Hong Kong people, mostly youths, staged a huge camp-out on the usually bustling highway. 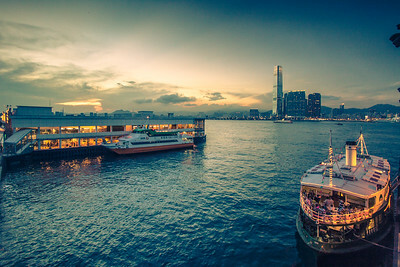 Hong Kong's Victoria Harbor is situated between Hong Kong island and Kowloon, the segment of the land mass that is known as China. Hong Kong itself is a region attached to China, existing autonomously until China swallows her up again in another 30 years. Hong Kong, itself, is a lot like Hawai'i. There is an island named "Hong Kong", but the entire region is known as Hong Kong, which includes 3 large islands, many smaller ones, and a chunk of mainland China. 8 Million people reside here, and it's a financial powerhouse along with one of the first successful "International City", acquiring it's own cultural identity and pride, often clashing with China's own interests. West Hong Kong, scattered with sunsets unseen. If you've come to Hong Kong for vacation, you've most likely visited this guy. 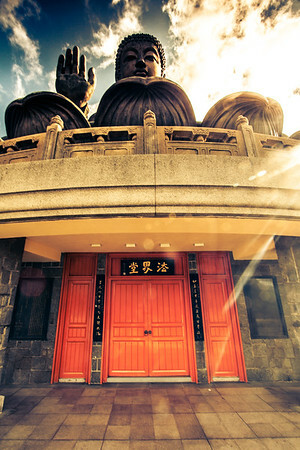 The buddha in Ngong Ping can be visited by taking a cable car to a remote area high in the mountainous region of one of Hong Kong's larger islands, Lantau. Then, visitors must hike up stairs to finally reach him. 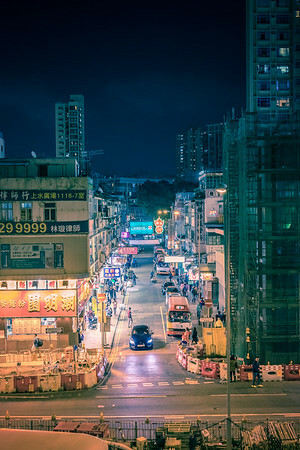 Mong Kok is one of the most densely populated areas in the world with around 340,000 people per square mile, compared to Manhattan, which has a density of 67,000. The district contains many areas that tailor to one theme, such as computer electronics, cameras, toys, airsoft rifles, pet stores, arcades, movies, maid cafe's, cosmetics, along with restaurants and clothing stores scattered throughout.